A ladder is a column of extended running threads that are surrounded on either side by normal stitches. They resemble the rungs of a ladder, hence the name. Laddering can happen in circular knitting in the area between the last stitch of one needle and the first stitch of the next. A ladder may be barely noticeable, or it may be so wide that it looks like a column of dropped stitches — neither of which is attractive or desirable. 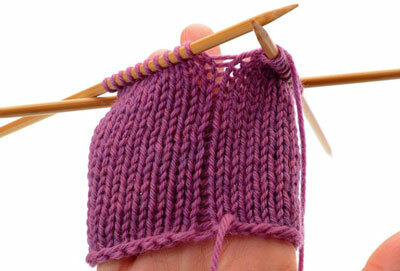 Laddering is a particular problem when using double-pointed needles, but it can also happen with the magic-loop and two-circular-needle methods. Since laddering occurs only at the joins between needles, it does not happen when using one circular needle in the traditional method. If you are having a problem with laddering and can’t use that method, try one of the solutions presented here. 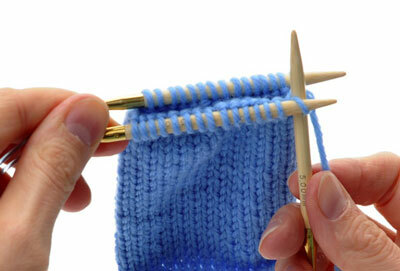 Some knitters find that working with a set of five double-pointed needles instead of four helps to reduce laddering. It increases the angle at which the needles meet and thereby eases the tension on the stitches in these locations ensuring that less laddering will occur. An easy way to reduce laddering is to pull the working yarn extra tight when working the first two stitches on every needle, as shown in the photo below. 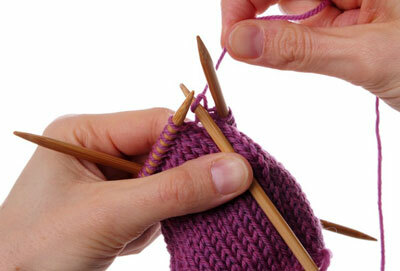 If you find that ladders are still present, you can also work the last two stitches on each needle tightly. If you are experiencing laddering when working in the round with two circulars, make sure that the stitches on the back circular needle are on the cable (not the needle tip) before you work the stitches on the front needle. Doing so will allow you to pull the first stitch on the front needle tighter, which will help balance the tension between the two cables. A popular remedy for laddering is to move the first few stitches on each needle to the previous needle after working every few rounds. This moves the location where the needles meet, thus moving the location of the ladder. This method doesn’t actually eliminate the ladder; it just staggers it so it is no longer vertical. However, it does make the laddering slightly less noticeable. If you are working in the magic loop method and are having trouble with ladders, make sure that the cable crosses over itself at the base of each loop. The cross in the cable helps the stitches on either side of the loop stay closer together.